I devote a lot of time to thinking and writing about lunch and dinner, but not breakfast. Left to my own devices, I'd probably eat cold leftovers or plain yogurt straight from the container every morning. Meals out still feel like a luxury, while breakfast is an at-home necessity, one that I prefer to take with my coffee, in my comfy pants, before I am fully conscious. But there's one breakfast dish that always seems to call to me, quietly and softly insisting that I get dressed and leave the house for it: ful, a humble, satisfying bowl of cooked fava beans. When I do, I am never disappointed. While the origins of ful—which you'll often see spelled as "foul," "fool," or "foule"—go back as far as ancient Egypt, ful is now eaten throughout the Middle East and East Africa, in countries such as Syria, Lebanon, Jordan, Yemen, Ethiopia, Eritrea, and Sudan. Ful's spices and accompaniments change with every country and cook who prepares it, but they include cumin, berbere, olive oil, tahini, parsley, lemon juice, fresh chilies, tomatoes, onion, hard-boiled eggs, and cheese. Eating ful requires no utensils, just a willingness to sop it up with pita, French bread, or spongy injera. But the heart and soul of ful is always dried fava beans. They begin as sad, brown, crumpled looking things, but after hours of the simple, miraculous act of cooking, they are transformed into something entirely new—supple, tender, and wholly comforting. In Seattle, where we are blessed with a large number of East African immigrants, ful abounds in our many Ethiopian cafes and restaurants. Much like Vietnamese pho, it pours out of the small kitchens in large quantities, a lifeblood that fuels a hungry community of workers with the energy they need to get through their days. For years, I've turned to the Central District's Cafe Selam for my ful needs. Here the ful is satiny smooth and spicy—the fava beans are lightly pureed with olive oil and red chili. It's served in a broad white bowl topped with freshly chopped scallions, tomatoes, and serrano chilies, as well as slices of hard-boiled egg and soft crumbles of feta cheese. A red plastic basket filled with two crusty French loaves accompanies each bowl. Immediately after it lands on the table, I'm tearing into the bread and dragging it through the stew. Hours later, my lips are still buzzing from its spice and heat. At Sunset Cafe on Rainier Avenue South, ful is served strictly during the morning hours. It is beautiful and shimmering, with swaths of grassy olive oil pooling on its surface. Two small mounds of piquant diced green chilies and white onion, as well as a bundle of roughly chopped fresh tomato, float on top, begging to be stirred into the beans. The favas, while soft, remain pleasantly firm enough to bite through. Each bowl is served with small slices French bread, as well as a small ramekin filled with a soft, spreadable farmer cheese whose creaminess echoes that of the beans. While you can easily drag the bread through the ful (remember: no need for utensils), consider spreading a little cheese on each slice and then topping it with favas and a few bits of onion, maybe a tiny piece of chili or two, as though you're composing your own personal hors d'oeuvres. It makes each bite feel special. Service at Sunset Cafe can move at its own leisurely pace, so if you're in need of a quicker ful fix, head across the street to Kaffa Cafe and Wine Bar, which is set up for more expedient coffee shop–type experience. While the ful here is a bit bland compared to Sunset, it's still quite tasty, and between the heady mix of berbere, coffee, and incense in the air, you may catch a little buzz. There's an attention to detail here—red onions, jalapeños, and tomatoes are diced with precision and, along with some dry cheese (it resembles the dusty Parmesan cheese that comes in packets with pizzas), lovingly placed in their own quadrant on top of the bowl. Way up north in the Pinehurst neighborhood, Jebena Cafe serves what is certainly Seattle's most beautiful bowl of ful. A crimson sea of favas—long simmered with berbere and tomato—fills a vintage green bowl, shaped like a leaf, that sits atop a matching plate. It's showered with diced green chilies, scallions, feta cheese, and a generous amount of olive oil that adds a silky richness. The ful is already wonderfully spiced, but a final sprinkling of what tastes like cardamom and black pepper lights up your senses as you bend over and breathe in its scent. Jebena's ful is astonishingly creamy—each scoop looks like it holds whole softened favas, but once inside your mouth, the skins melt away and suddenly your tongue is awash in a texture so lush and velvety, it's hard to imagine the beans were ever dried. The whole French rolls served with the bread have thoughtfully been heated up just before serving. Just as pho has come to occupy an integral part of Seattle's consciousness and daily life, ful is making its way into the more mainstream fabric of the city. In Fremont, the lovely upscale cafe and wine shop Vif occasionally serves their own version of it. Vif's spring ful, made from chickpeas and red lentils instead of favas, had decidedly seasonal Northwest elements: soft-boiled farm egg, English peas, radishes, and soft herbs such as mint and chive blossoms. As ful finds new audiences, it remains a dish tied to another part of the world. As I sat in Jebena last week, breathing in the scent of incense that lingers in the dining room and eavesdropping on conversations spoken in Amharic, I felt transported. 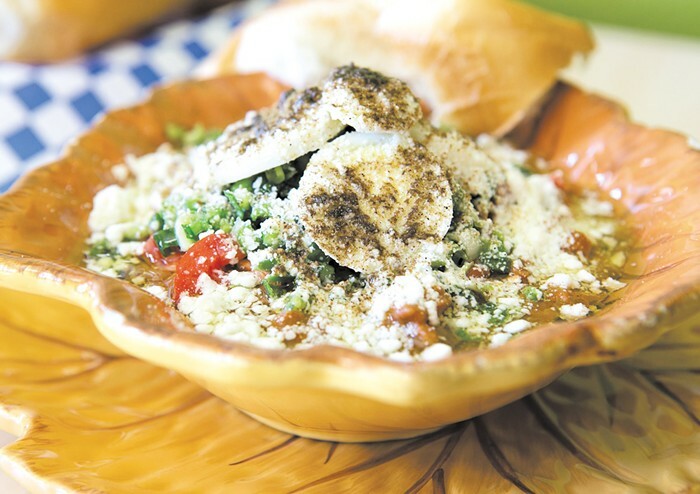 But as I looked down at my bowl, I noticed that the way the white crumbles of feta sit on its piled-high toppings look like a dusting of snow on a mountain. I'll admit I have a tendency to fall in love and rhapsodize about whatever plate of food happens to be in front of me, but for a moment it reminded me of gazing down at Mount Rainier from an airplane—another thing that makes me feel lucky to call this corner of the world home.